There are only 4 seniors/elders in the Rider-Waite deck. I have a soft spot for elders, I have Saturn in my natal 1st house, and I’m not surprised that I intentionally chose to seek out the old in my deck. The first man is Baba Arugbo- the Emperor. I like to call him O̩bàtálá because he shares very significant characteristics with the father of the “òrìs̩à”s. He is wise, and he is a good leader/ruler. There are several lessons to learn from him, including his courage, sense of judgement, and wisdom. If one is too big to serve, one is too small to lead; a good leader is a servant. If you look behind his throne, there’s a small, blue stream that runs behind him. This tells me that although he is logical, methodical, disciplined, dedicated, and meticulous, he is not heartless. He is an experienced and balanced person, and a balance between one’s thoughts and emotions is necessary when one is in a position of power/authority. 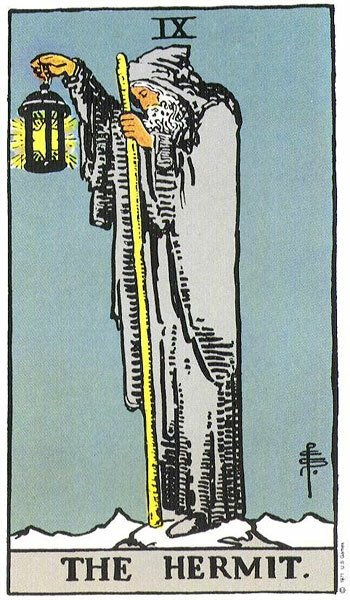 The second is The Hermit. This is an elder who probably lives alone, or has a place where he likes to go/sit alone in order to ponder on some things- the kind that you’d frequently visit or call for words of wisdom/advice. He is a writer too, and Baba Wole Soyinka/Araba Ifayemi Elebuibon always come to my mind whenever I see him. He is a wise sage, a knowledgable man, a seer. He is analytical and insightful, and unlike The Fool that he was when he was younger, when he was seeking to explore everything and anything, he has a decent sense of direction, and a desire to not just spread his knowledge but acquire more. He is a life-long learner. 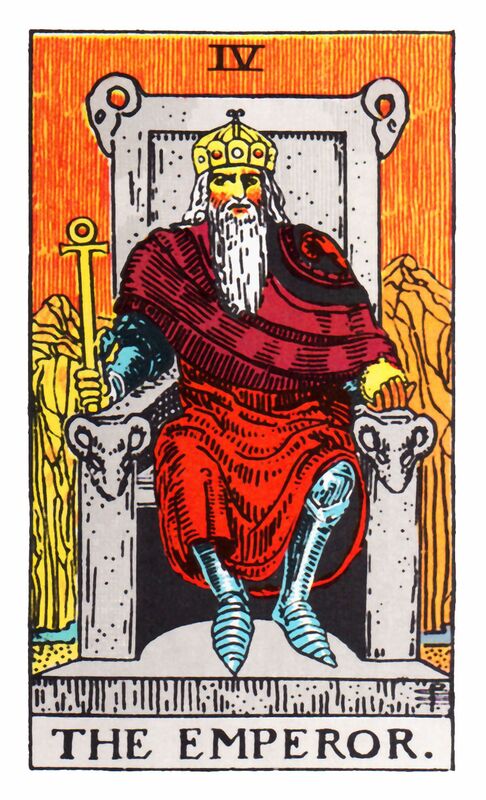 The third is the old man in the 10 of Pentacles, sitting by the corner. 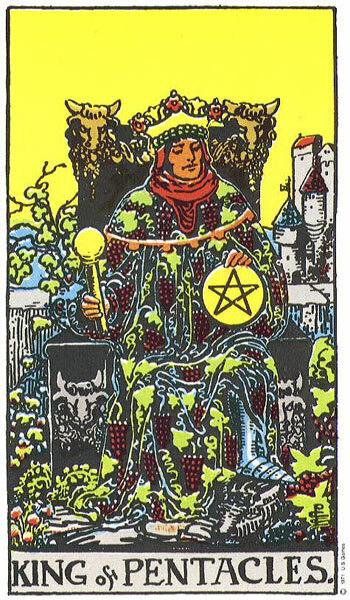 The cloak that he’s wearing tells me who he is- The King of Pentacles! He spent almost all his life gathering up his luxury/wealth, and him being included in the 10 of Pentacles tells me that he had a lot to do with the wealth that the nuclear family in the image has- he has a lot of possessions that his generations would continue to inherit. 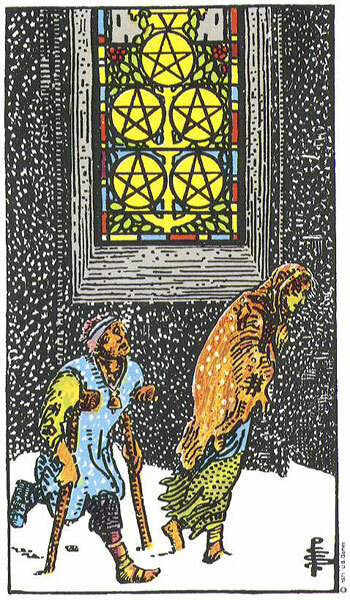 Something tells me that he was once dirt-poor [5 of Pentacles], and perhaps, the woman he loved left him for a wealthier man. I think of it as slightly similar to a Fitzgerald’s “Great Gatsby” situation, but not necessarily- his situation was not as sad in the end, as we can see. You have to forgive me, I’m Neptunian; I may be totally wrong. I don’t think the King of Pentacles was born rich though. This is a man that had to work himself silly to become a King. The 6 of Pentacles indicates that he tried to beg but he didn’t receive; he was not fairly or humanely treated by the self-righteous person he was asking for help from. He tried his hands on certain things that did not work out or yield the kind of results that he hoped for; he went through frustrations- 7 of Pentacles. He contemplated on what to do next, and he began the business that made him wealthy- 8 of Pentacles. There’s a smile in the 8 of Pentacles; it’s so heartwarming. The woman wearing red in the 10 of Pentacles is the one in the 3 of Cups- she’s Fitzgerald’s Daisy and Adichie’s Kosi- as long as she’s married to a rich man and she has a life of luxury, she’s good. She’s not the King of Pentacles’ daughter; she’s the one the King’s son married. The fourth, the one I worry about, is the old woman in the 9 of Swords. She is filled with regret, as you can see. She’s not really depressed to me, as much as I would like to go with other interpretations and state that she is; at this point, it’s not really an emotional thing. Depression seems like a ready-made, go-to answer for what’s going on, but it isn’t depression. When I look at the 5 of Cups and the 9 of Swords, I see vast differences. For the 9 of Swords, this isn’t really an emotional thing as much as it is a mental thing. She is sitting upright with her face in her palms, and she has a flowery [roses] blanket that indicates desire, so she’s okay right now, but she’s sad about a past occurrence that probably involved the unfulfillment of a desire or two. To understand the present, one has to look to the past. 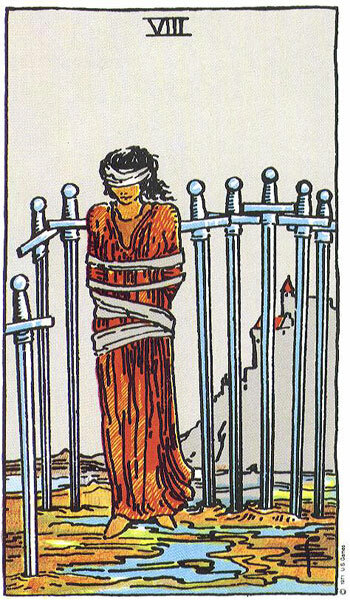 At a point, she lived a very restricted/limited life- 8 of Swords. Why? Well, let’s examine the card before the 8 of Swords. The 7 of Swords had something to do with it. He’s holding 5 Swords and leaving 2. 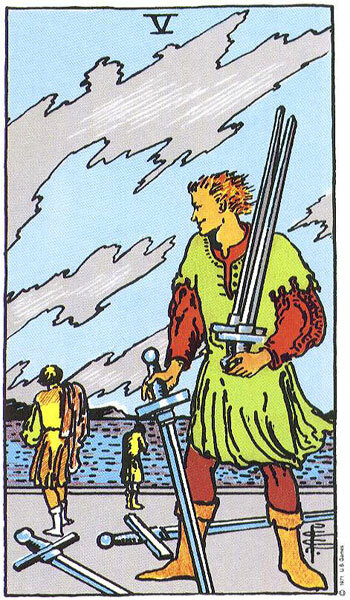 He’s manipulative/secretly doing something/winning in his game, and leaving the 2 of Swords to believe their truth- hold their swords to their chest and refuse to see the light/reality [in the negative sense]. The bed the old lady is sitting on has a wood etching of someone being slain by a sword, and this confirms that someone did her wrong in the past. After a major separation that I had with someone, that I now know was for my own good, I used to be the 9 of Swords. I would wake up in the middle of the night from stressful dreams/have flashbacks. I would wish that I did not do certain things when I did them, or wish that I had, when I should have done them. At that time, I would see the other person in my dreams, and in those dreams, I would try, for a long time, to make them look into my eyes, but to no avail. For this old lady, it could have been domestic violence, or being lied to, or being extorted, or being emotionally and mentally manipulated, or being made to feel inferior so someone else could have the upper hand. This old lady wishes she had known then, what she now knows. All in all, it indicates unfulfilled desires, desires for love, desires for winning in life, desires for happiness, satisfaction, and contentment.